In this lesson, you’ll learn how to draw an open mouth. 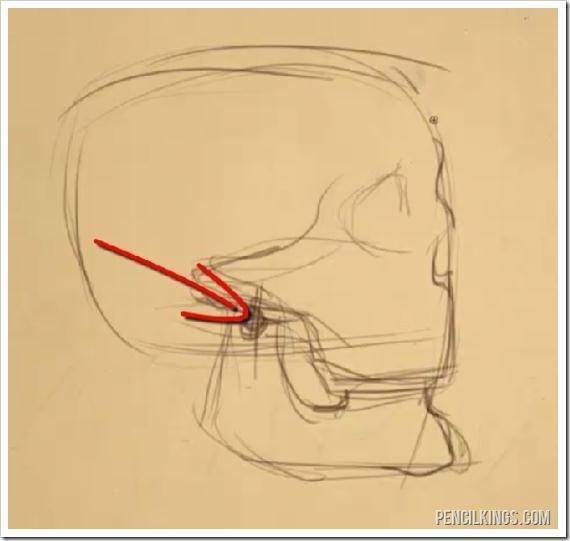 First, you will go over how the basic mechanics of how the jaw works, and then you’ll progress into actually opening up the jaw so you can really understand how to draw a mouth that is fully opened. Start off with a simplified drawing of the skull. Check out this blog post on How to Draw a Skull for a quick and easy way to do this. 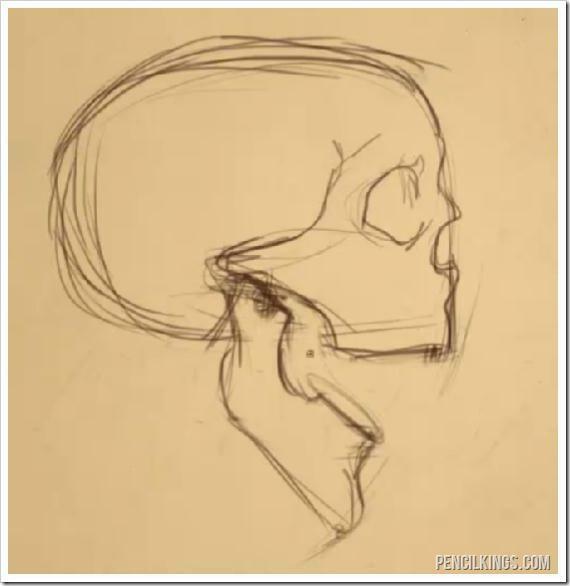 You will be focusing on the mouth and the jawbone, so don’t worry if the rest of the skull isn’t as defined in your drawing – you’re focusing on the mouth, so no need to waste time detailing the other parts. In the video you can follow along as Sycra draws the skull, or you can simply copy the image above to get the same effect. The most important thing to note when learning how to draw an open mouth is where the jaw is attached to the rest of the skull. 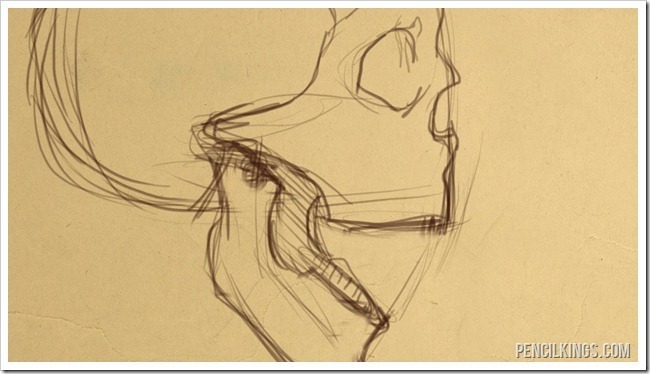 The point where it joins is where the jaw bone will pivot from as it opens. The upper part of the mouth never really moves. The upper lip can slide up and down along the upper row of teeth, but the teeth themselves are anchored to the skull. As the jaw swings open, the mouth will also stretch and open. 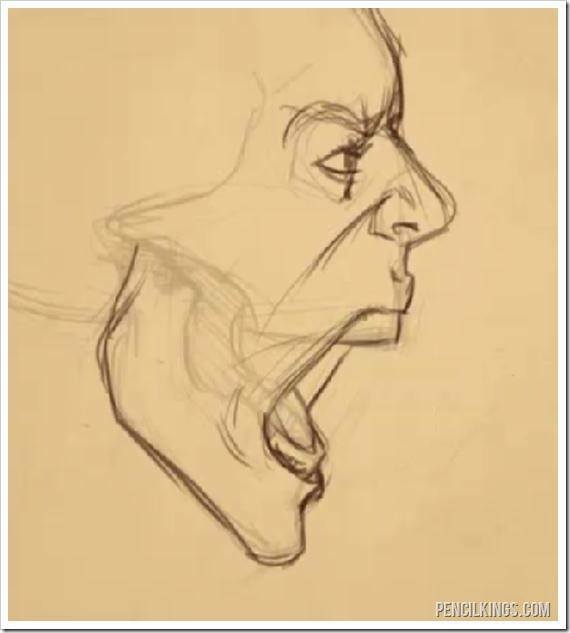 For this study of the mouth you’ll be drawing someone that’s screaming to give you an extreme example of drawing an open mouth. In order to get the placement of the jaw as it swings open you can imagine that there is a string that starts at the pivot point of the jaw and extends out the most forward point of the teeth or chin. Another way would be to dig out your old geometry set and place the pivot at the pivot point of the jaw, and place the pencil at the tip of the chin or the teeth (either can be used) and then drawing an arc to keep the size of the jaw consistent as it swings open to any degree. Notice in this image that there is a tilted oval drawn where the lower teeth will eventually go. This helps to establish the curvature of the mouth in three dimensions, and you’ll be expanding on that in the next step. 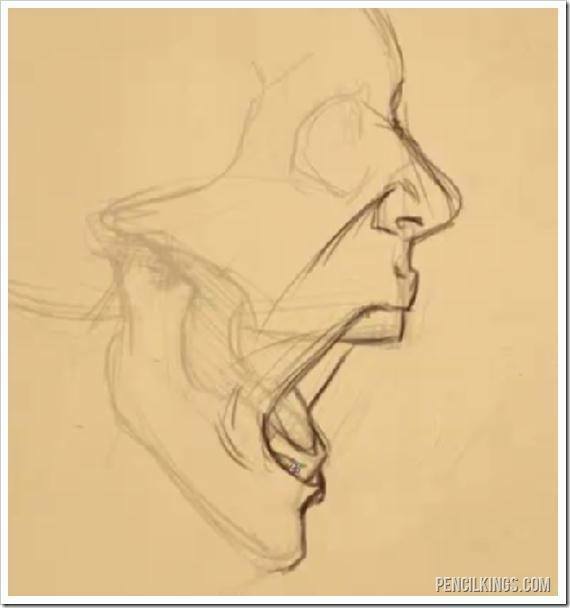 To deepen your understanding of how to draw an open mouth, you can fill in the back facing side of jaw while remembering to incorporate the curve of the mouth. Here’s a look at the open mouth drawing with a little more detail added into the face. 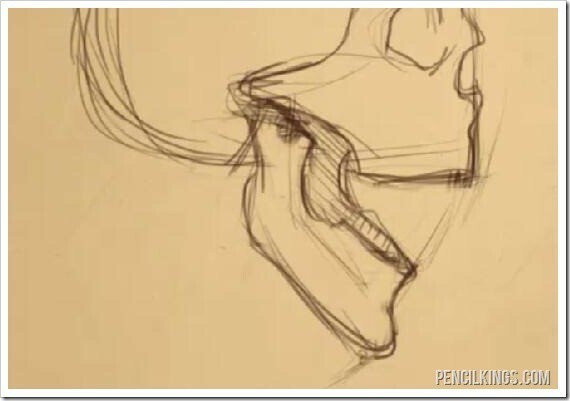 We hope you enjoyed and learned a lot from this lesson series on how to draw a mouth! Don’t be shy – leave a comment below and let us know your thoughts. Very very nice and good an helpful! now show us how to draw a mouth open 3/4 from behind.